In 2009, virtual computing company VMware was in a state of transition. The founder and CEO had left and a new leader was at the helm. While server virtualization had powered a decade of success, the company needed to find its next revenue growth engine. The CEO had made several acquisitions, but employees struggled to understand why. The company decided to take an unconventional route to address a rapidly changing landscape: Do a business simulation. VMware partnered with consultancy BTS to build a simulation that mimicked the challenges facing the company. The two-day “game” forced company leaders to wrestle with funding challenges and make trade offs between short- and long-term investments. Leaders also swapped roles, such as sales switching with product. The all-encompassing exercise did the trick, upleveling empathy, understanding and collaboration at a critical time. Then-VP Yvonne Wassenaar saw the success of the simulation firsthand and has since become a passionate advocate for the exercises. She’s also a pro at growing companies. At VMware, Wassenaar helped triple company’s revenue from $2 billion to $6 billion and adopted simulations to help pivot the 1,500-plus person sales force to selling a broader product portfolio. 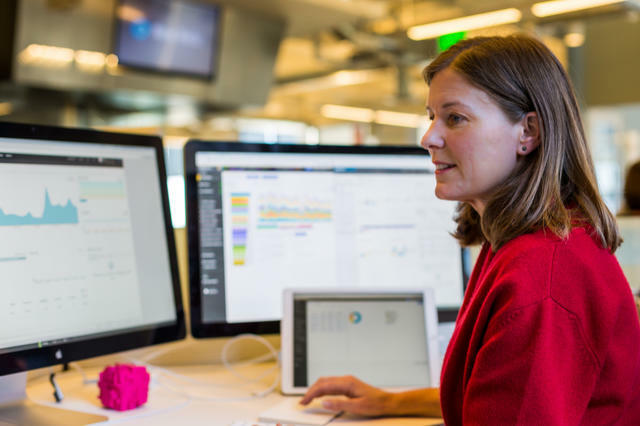 Now as New Relic’s CIO, she’s been quick to employ simulations at the software analytics company, which she helped prepare for an IPO and more than double annual recurring revenue to $250 million within two years. Before that, Wassenaar spent nearly two decades at Accenture, where she held a variety of roles, from software engineer to global sales operations lead to partner. She serves on the boards of Bitium, the Athena Alliance and Harvey Mudd College. Wassenaar was listed as one of the Top Influential Women of 2016, theBoardlist Top 20 and a Wall Street Journal Woman of Note. Simulations are used by pilots, the military and disaster response teams to prepare themselves for highly intense and hard-to-predict situations like catastrophes and attacks. Wassenaar believes that startups can also use them to build more resilient teams and prepare employees for change. Here, Wassenaar outlines why simulations are invaluable, when they’re most effective and how to use them to help startups maneuver through difficult junctures. At six years old, many considered New Relic a darling of the startup community. The 550-person company had been on a star run fueled by an engaging CEO and rave reviews from software developers. But as the company prepared for an IPO, executives realized they would need to pivot to continue aggressive growth. Doing so meant shifting from selling to software developers to targeting larger enterprise buyers, meaning they needed to build an enterprise sales team from the ground up. Making those changes wasn’t easy. First, there were varying levels of buy-in on the decision to move into the enterprise space. Second, there was tension around the trade-offs being asked of the product team. What’s more, budget shifts were making employees tense and frustrated. To help address these challenges, the company chose to do a business simulation. Wassenaar, then the SVP of Operations, set a goal: Drive understanding and alignment across the top 30 company leaders so they could all more effectively execute and support each other in the move to enterprise. To prepare the simulation, Wassenaar partnered with BTS consultants and asked for input from the finance team, with about 15 people who were interviewed in advance of the exercise. The process took about six weeks. The setup of a simulation was simple: Teams competed against each other running the company over a three-year period. “Done right, it’s a lively and engaging process. We played three rounds, and each round of the game represented a year. In each round, teams made a set of trade-off decisions and investments that were run and scored against expected trends built into a premade forecast model kept secret from participants until the simulation. To keep it interesting, we threw unexpected events that required teams to react, like a competitor making a hot acquisition or a sudden security breach,” Wassenaar says. “After the simulation, the teams were scored and ranked by highest revenue, profitability and customer satisfaction. Then the teams debriefed and examined their performance. At the end of the ‘three years,’ the team with the highest weighted score won. 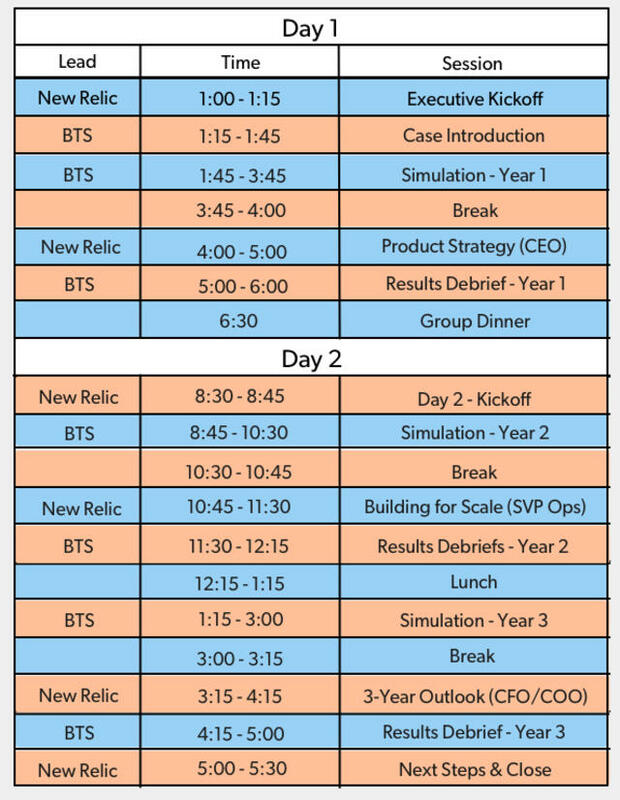 An agenda for a New Relic simulation. Watch kids at play. They cover a lot of ground, because they’re having fun. Business simulations recreate that feeling and energy. Expansion into new customer segments or selling styles. This is a situation that can be challenging to effectively execute. It often takes the shape of moving from one style of selling to another, or perhaps moving to a higher-level or different buyer in an organization. “It’s a challenge to reframe your employees’ thinking and turn them on to working in a new way and with new buyers in mind,” says Wassenaar. “The benefits from a simulation effort in this area include doing a role reversal that helps people better appreciate and deeply internalize the world from the vantage point of their new buyers. It allows people to practice how to position their product more effectively given the makeup of the buyer and how they think." If the preparation and execution of simulations sound involved and complicated, it’s true – they can be. Great simulations are realistic replicas of real-life scenarios without being overly complex. They’re engaging, regardless of whether they’re role reversals (like having people ops and engineering swap roles), scenario trainings (such as testing crisis preparation or a new product launch) or company simulations (in which a few people run a simulated company). In all formats, you need to have involvement from top executives and the resulting buy-in from other managers and participants. Here, Wassenaar lays out the five mistakes to avoid to increase your chances of running a seamless simulation. Assembling teams that are too big or too small. Simulations can go south when companies choose the wrong group size. “I have seen successful simulations done with 25 people and up to 200 people. The overall size is less important than the team size — the ideal team size is four to eight people. That’s large enough to have different viewpoints and small enough that everyone can have a role and is forced to engaged in the discussion. For a big simulation, the greatest challenge is having enough experienced coaches. To work around this, you can rely more heavily on the people who built the simulation, or roll it out in phases where people who’ve already been participants in the simulation become coaches for future groups going through it,” Wassenaar says. One of the first hurdles is converting the faction of people who don’t think there’s time for a business simulation. Simulations are fun, but not cheap. It’s a big investment of time and you pay to play. So make them count. Simulations can be your secret weapon when you hit a roadblock as a company or a tough turning point. They’re an investment of time and energy, but can yield significant returns. The best simulations are realistic, not overly complicated and have high executive engagement. Leaders need to be on board with the plan and support it from both a content and a morale standpoint. Companies can benefit from simulations when they’re trying out a new strategy, pivoting the business or any milestone that might throw employees into disarray. Photographs courtesy of New Relic.